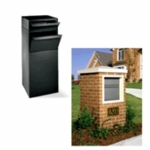 As the leading manufacturer of high-security residential and commercial locking mailboxes, all dVault mailboxes boast superior strength and come in a wide array of sizes and finishes. 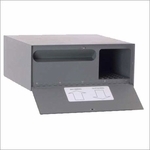 dVault high-security products include curbside delivery vaults, collection bins, post mount mailboxes, and wall mount mailboxes. 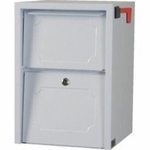 All dVault mail delivery receptacles have excellent anti-theft features and, better still, are approved by the United States Postal Service (USPS). Further, all dVault mailboxes are made right here in the USA. With a dVault locking mailbox from BudgetMailboxes.com, you'll never have to worry about mail theft again. Dvault Mailboxes are a solution to the nations growing ID theft dilemma. The Federal Trade Commission reports that identity theft reports nearly triple in just a few years in many states; given this escalation, it makes sense to buy a locking mailbox. Dvault is on the cutting edge of mail security innovation with patented systems and a national brand name Dvault Locking Mailboxes are in a class of their own. Call us with questions! The vaults also have a variety of ways that they can be dressed up as well. 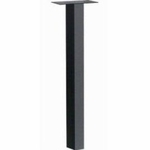 They are available in 4 different colors and can be surrounded in a brick column or some beautiful landscaping. 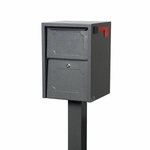 If you have packages delivered to your door step this USPS approved mailbox is for you. How does the security-drop door mechanism work? 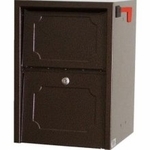 As the security-drop door mechanism is opened (hinged horizontally), a unique hidden security door extends towards the back of the unit, blocking access to items previously deposited and held in the package storage compartment or hold. What size packages will the Delivery Vault unit accept? • parcels at 12" x 10" x 4" and a combination of smaller parcels of various sizes. • Wall-Mount units storage capacity may be limited by the area within the interior of the structure. Note: dVault has not received any negative customer feedback relating to delivery or capacity concerns. I like your products, but they seem large. Do you offer smaller units? dVault products have been design engineered to accept the most frequently sent packages and parcels of various size. The company cautions those who may choose mailboxes of smaller sizes as even a small bottle of perfume is packed and shipped in a 10 inch cube... a tall order for the majority of mailboxes offered today. How do I access deposited packages from Delivery Vault units? Access to the curbside unit is from a rear key locked door. The access door dimensions are 26"H x 18.5"W. Access to the Wall-Mount units are from the interior of the wall or structure (key locked). How do the curbside units anchor or fasten to the ground? There are five bolt holes at the bottom of the unit for fast and easy installation. dVault recommends that units are anchored to a flat solid surface, such as concrete. I live near the beach, which unit do you suggest? 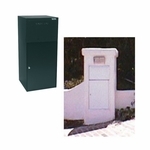 dVault recommends Model Number DVU0050 for installations at or near coastal regions. Will delivery agents and couriers deliver items to the Delivery Vault? delivery agents provide such a release form on the back side of their "sorry we missed you" door hang-tags. 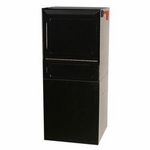 I like model number DVCS0023, do you offer this model on a pedestal? 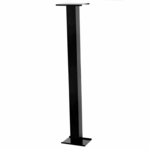 Yes, a pedestal is available. Can I purchase extra totes for model number DVCS0023? Yes, extra totes are available and may be purchased from the reseller nearest you. 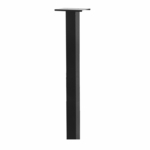 easily installed without disturbing the installation structure or decorative materials. Galvannealed steel is a carbon steel sheet coated with zinc on both sides by the continuous hot-dipped process. Immediately as the strip exits the coating bath, the zinc coating is subjected to an in-line heat treatment that converts the entire coating to a zinc-iron alloy. After post painting with proper selected primers and paints, the combined paint/galvannealed coating offers excellent resistance to peeling, blistering of the paint in addition to long lasting corrosion resistance compared with conventional galvanized sheet. Yes. Please contact the dVault Sales Department for shipping and handling questions. I need someone to install my new Delivery Vault. Can you recommend anyone? Ask your home improvement specialist, contractor or handyman. Installation services are also available at The Home Depot Companies and Lowe's Home Improvement. Curbside units are shipped on pallets via motor freight. 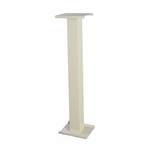 Post/Column and Wall-Mount units are normally shipped via UPS (United Parcel Service) depending upon order quantity. investment in creating an "Online Catalog," "Product Knowledge" and specialty brochures. By dVault doing its part to help the environment, we are also able to reduce paper, postage and handling costs, allowing dVault to maintain lower retailer and distributor costs of its products. What are the dVault Information Systems? Our patented Information Systems are currently in the integration and testing phases and may be easily added to all dVault Models. It is not necessary to purchase the optional Information Systems. All dVault Models have been engineered with the primary purpose of accepting the delivery of packages, mail, and other special delivery items. 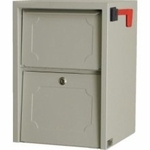 The Information Systems are an option and are easy add-ons to our safe, secure and private delivery boxes. Do you have commercial models and sizes available? Commercial models and sizes are available. Please call for details. Are dVault curbside units U. S. Postal Service approved? Yes, Full-Service Model Number DVCS0015 was Approved By The Post Master General on April 15, 2004. Other dVault models may be installed - print the model number using the print function of your browser and take it to your local Post Master for approval. Can I cover the curbside unit with regular brick, stucco or other materials? architectural and landscaping themes. Ask your home improvement specialist or contractor. Question: Is there a dVault locking letterbox available? 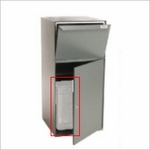 Answer: Yes, we do offer dVault Full Service Locking Letterbox. Thank you.